Put the cursor on the root node called, "Server Manager"
2. 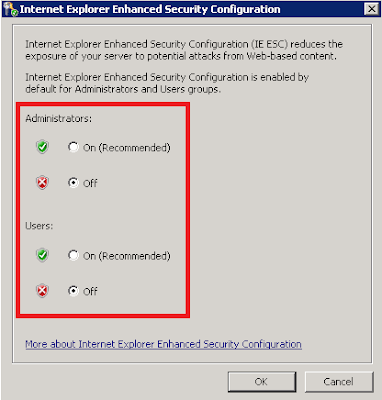 Turn Off the Internet Explorer Enhanced Security Configuration for Administrators and Users. Thanks Nickolas very helpfull. I believe you previously presented at SharePoint Saturday in Boston, I attended. Thanks Dave! I always forget about that config setting so had to post it. See you at one of the events! Really appreciate the solution posted. After working around in circles trying to figure out what was wrong your solution worked. Thanks a lot for the post! screen shots helped a lot in fixing the issue in no time. thanks once again!! !